Wow, yeah, it's crazy. Every where I look there's a new hydrogen fuel station. (Not.) I've been all over TX, OK, and FL in the last 6 months and haven't seen any construction work on any of these new hydrogen refueling stations. Zero, zip, nada. Gotta buy the properties, get local approvals and permitting for tanks with explosive materials, etc. Maybe there will be hydrogen trucks long before there is actually a place to refuel them. "Hello, is this Pilot Truck Stop on I-20? Yeah, good, listen, I'm about 15 miles east of you. Can you bring me 40 lbs. of liquid hydrogen? Hello? Hello? Damn, I think he hung up on me." Well guys I do know a guy who has recently constructed a hydrogen receipt facility of some sort just off I-495 just before Lowell MA. He did the civil work (ground, concrete). I think the customer may have been Praxair. Obviously this thin g was not built because of "hydrogen class 8s" but there are other needs for hydrogen. I'll see if I can get more details. There seems to be a distinct lack of stations along the east coast. The concentration of those littles will have to increase 10 fold. Nikola Motor Co. Sunday provided a few updates on the Nikola One tractor the company expects to road test next year. Via its Twitter account, the company says it is planning a “huge party/event” for customers, media and partners when the truck rolls off the test assembly line in 2018. The company also says the hydrogen fuel cell powered truck will feature a 6×4 configuration that is compatible with a dual or super single tires. The steer axle, Nikola says, will feature a nearly 60 degree turning radius. The tandem driveline, Nikola says, was engineered to handle a 30 percent grade loaded to 80,000 pounds at 0 mph standstill takeoff. Updates! 3- Nikola One will have 6×4 all wheel drive. Nearly 60 degree turning. Duals or super single compatible. Road testing next year. It'll also have a built-in soft serve ice cream machine, it'll come with a trained driver, it has a stable built in for the unicorn that comes with it and the exhaust will shoot out bubbles and rainbows. 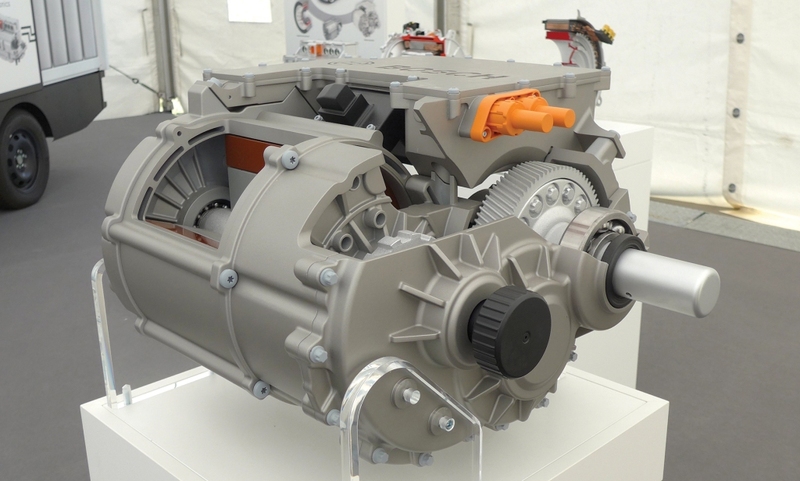 Nikola Motor Company and Bosch have teamed up to develop an electric powertrain designed for Nikola’s long-haul electric heavy-duty trucks. The development partnership will bring to market a fuel cell and commercial vehicle eAxle for Nikola’s Class 8 hydrogen-electric truck, slated for production by 2021. Nikola plans to launch the Nikola One and Two, daycab and sleeper versions of its electric truck, that promise 1,000 horsepower and 2,000 lb.-ft. of torque. The eAxle developed by Bosch is a scalable, modular platform, with the motor, power electronics and transmission in a single unit. It is designed to be suitable for vehicles of all kinds. Nikola and Bosch will use this technology to create a dual-motor commercial vehicle eAxle designed for a long-haul truck. The eAxles will be paired with a custom-designed fuel cell system – also being developed jointly by Nikola and Bosch – designed to deliver the desired vehicle range. The overall vehicle controls will also be jointly developed based upon Bosch's vehicle control software and hardware. Bosch and Nikola will also jointly develop the overall powertrain system for the Nikola lineup, which will include the safety concept and vehicle electrical architecture. "We have been aggressively pursuing our goal of bringing the most advanced semi-truck ever built to market," said Trevor Milton, Nikola Founder and CEO. "The powertrain requires an innovative and flexible partner able to adapt quickly to the speed of our team. Bosch has empowered us to come to market quickly with automotive-grade hardware and software so our vision can become a reality." "Breakthrough mobility technology requires visionary targets, speed to-market and disciplined structure to ensure long-term success," said Markus Heyn, member of the Bosch board of management responsible for the commercial vehicle organization . "Together with Nikola we are pushing ourselves to realize new levels of technological achievement and market penetration." By 2021, Nikola intends to bring to market the Nikola One and Two, a class 8 hydrogen-electric truck lineup that will deliver more than 1,000 horsepower and 2,000 lb-ft (2,712 N·m) of torque—nearly double the horsepower of any semi-truck on the road—all with zero tailpipe emissions, as previously announced by Nikola. At the heart of the Nikola truck lineup is a new commercial vehicle powertrain achieved thanks to a development partnership between Nikola and Bosch. The organizations re-imagined the powertrain from the ground up. Bosch’s eAxle expertise (earlier post) has enabled Nikola to move quickly on an aggressive path to bring its electric truck to market. The eAxle will use proven commercial vehicle electric machine technology and SMG (separate motor generator) motors from Bosch, and will realize what the partners call “unprecedented” targets for e-machine efficiency. The eAxles will be paired with a custom-designed fuel cell system—also being developed jointly between Nikola and Bosch—designed to deliver benchmark vehicle range. The overall vehicle controls will also be jointly developed based upon Bosch’s vehicle control software and hardware. The Nikola Bosch zero local emission powertrain is designed to achieve segment-leading performance at a competitive total cost of ownership to traditional powertrains. Bosch and Nikola will also jointly develop the overall powertrain system for the Nikola lineup, which will include the safety concept and vehicle electrical architecture. 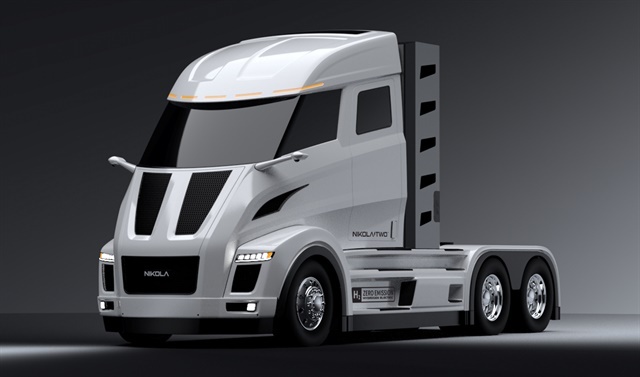 Nikola Motor Co. announced Bosch Group will play a key role in supplying powertrain components for its over-the-road and day cab Class 8 hydrogen-electric trucks, which are scheduled to come to market in 2021. Stuttgart, Germany-based Bosch will supply Nikola with its eAxle, which has a motor, power electronics and transmission in one compact unit, according to Salt Lake City-based Nikola. The companies also announced they will jointly develop a custom-designed fuel cell system for the trucks. The overall vehicle controls will be jointly developed based upon Bosch’s vehicle control software and hardware. 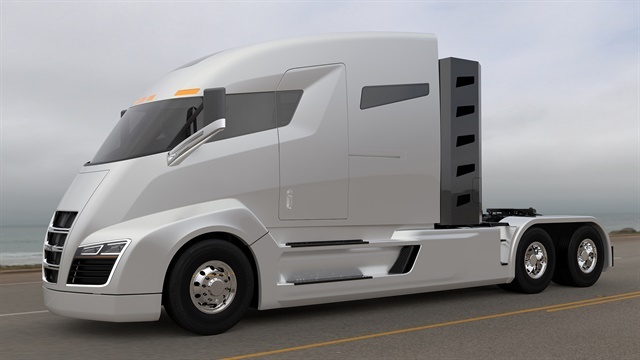 Referring to it as the “Nikola Bosch zero local emission powertrain,” the truck maker said in a statement that the system is designed to achieve “segment-leading performance” at a competitive total cost of ownership to traditional powertrains. “Bosch has empowered us to come to market quickly with automotive-grade hardware and software so our vision can become a reality,” Nikola founder and CEO Trevor Milton said in a statement. The trucks, first announced in December 2016, are intended to deliver more than 1,000 horsepower and 2,000 pound-feet of torque, according to Nikola. Makes sense since most of the E.U. are banning internal combustion between 2025 and 2040. Nikola Motor Company has officially named Bosch and PowerCell AB as the primary suppliers of its fuel cells for the upcoming Nikola Class 8 hydrogen-electric truck. The fuel cell used in the Nikola truck is projected to output more than 300 kilowatts continuously and was designed to handle the lease period of one million miles per truck. Nikola says its fuel cell will be one of the most power dense and advanced fuel cells on the market and is a critical piece of the Nikola drivetrain. Nikola has been a partner with Nikola on the electric powertrain, developing a dual-motor commercial vehicle powertrain based on the company’s eAxel design as well as the fuel cell. Joining the fuel cell development team is PowerCell AB of Sweden as the primary stack supplier for the fuel cells in the first pre-production testing vehicles. If all goes well during road testing, PowerCell will be integrated into the production lineup, according to Nikola. Nikola plans to announce a secondary stack supplier in 2018 that will act as a backup and overflow for any testing issues or production bottlenecks. The fully operational, pre-production Nikola Two day-cab will begin testing in Fall of 2018. Following its release, the Nikola Two will undergo a rigorous 12-month testing period in extreme climates. This testing period will give the company valuable data in preparation for full production in 2021. The first 5,000 trucks will be built at Fitzgerald Gliders in Tennessee while Nikola builds its own manufacturing facility. The location of the Nikola manufacturing facility will be named in early 2018. Wabco Holdings has announced a $10 million strategic investment in Nikola Motor Company, manufacturer of the upcoming Nikola One and Nikola Two hydrogen-electric Class 8 trucks. In addition to the investment, which gives the Belgium-based Wabco a 1% equity stake in Nikola, the companies signed an agreement to accelerate the development of safety technologies specifically designed for electric commercial vehicles. These technologies include electronic braking systems as well as traction and stability control technologies. Nikola’s first vehicle, the Nikola One, was unveiled in late 2016 and is expected to go into production by 2021. The company will begin testing the truck in fleets in 2018. Nikola will offer Nikola One and Two, daycab and sleeper versions, respectively, that promise to generate1,000 horsepower and 2,000 lb.-ft. of torque. The vehicle features a hydrogen fuel cell, electric motor hybrid setup that allows it to travel 800 to 1,200 miles on a single fill-up while operating free of emissions. Nikola Motor Company has selected Buckeye, Arizona, for its hydrogen-electric semi-truck manufacturing headquarters facility. The 1-million-square-foot facility will be located on the west side of Phoenix and could bring $1 billion in capital investment to the region by 2024, according to Nikola. Factors cited in its decision include the state’s pro-business environment, engineering schools, educated workforce, and a geographic location that provides direct access to major markets. Nikola spent 12 months considering 30 site locations in nine states before settling on the Phoenix suburb. Development of the manufacturing plant on a 500-acre parcel of land is projected to begin by the end of 2019. The site is at one of the entrances to Douglas Ranch/Trillium, a new master planned community being developed by El Dorado Holdings and JDM Partners; this community is projected to ultimately be home to more than 300,000 residents. When the economy tanks this so called "smart city" will tank too. SEATTLE – [Foreign-owned] beer maker Anheuser-Busch said on Thursday it reserved up to 800 hydrogen-fueled semi-trucks from Nikola Motor Co. as part of plans to convert its dedicated long-haul fleet to renewable powered trucks by 2025. The order would be large when compared to pre-orders so far for Tesla Inc’s all-electric Semi and is further evidence that fleets needing to move cargo hundreds of miles are willing to give nascent, costlier technologies a try. Truck makers such as Daimler AG, Navistar International Corp. and its partner Volkswagen AG are also investing in electric models in a bet that the market will shift over the next decade. Anheuser-Busch expects to integrate the trucks into its fleet beginning in 2020, it said, but both companies declined to say how much if anything Anheuser-Busch plunked down to reserve the trucks or how many would ultimately be added to the beer maker’s network. Salt Lake City, Utah-based Nikola said its trucks will have a range of between 500-1,200 miles and take about 20 minutes to re-fuel, shaving minutes off the average time it takes to fuel up a diesel rig. Time-tested diesel trucks are capable of traveling up to 1,000 miles on a single tank of fuel and cost about $150,000 on average. Nikola said it plans to charge $400,000 on average for its trucks, but tractors can be leased as well. Truck leasing firm Ryder System Inc. will be providing the dealer network for sales and service, Nikola said. Nikola CEO Trevor Milton said the company plans to build more than 700 hydrogen stations across the United States and Canada by 2028 and the company has nearly $9 billion worth of pre-orders, though its trucks are still in the prototype phase. “We are building to order, not speculation, and are very excited for what’s to come,” Milton said, in a not-so-veiled dig at Tesla, which announced plans for producing its all-electric Semi in November. Tesla promises its Semi will be delivered next year with a range of up to 500 miles on a single charge. It has more than 450 reservations so far -- including 40 from Anheuser-Busch -- but faces skepticism over range, payload, and cost. The fight between Nikola and Tesla -- companies named after the Serbian inventor Nikola Tesla -- spilled from the highway to the courtroom this week when Nikola sued Tesla alleging design patent infringements. PHOENIX. Arizona – Nikola Motor Company announced today that it anticipates the $200 million C round will be oversubscribed with more than $100 million already raised and funded this month. The company has a $1.1 billion pre-money valuation. “Nikola’s business model has been vetted, and the investment world is taking notice. So far this year we have kicked-off plans to build the largest hydrogen network in the world with NEL, secured a massive 800-truck order commitment from Anheuser-Busch, developed the most energy dense battery system on the market with almost 400 watt hours per liter, engineered a 240 kW fuel cell, kicked-off electric vehicle stability controls and electric ABS with Wabco, designed a thermo-management and HVAC system with Mahle, finalized the most advanced class-8 independent suspension on the market with Meritor, relocated our company to Arizona to build our new 150,000 sq. ft. headquarters and now closed on $100,000,000,” said CEO Trevor Milton. Milton also added that the company will soon announce a 2019 event in Phoenix, where customers, suppliers, media and industry insiders will be able to see all the latest Nikola products in action. Nikola Motor Company is pioneering hydrogen-electric renewable technology. The zero-emission trucks — which will be able to travel between 500 and 1,200 miles and be refilled within 20 minutes —will be part of fleets beginning in 2020 and in full production by 2021. To date, the company has nearly $11 billion in pre-order reservations. By 2028, Nikola is planning on having more than 700 hydrogen stations across the U.S. and Canada. The first 14 stations will be up and running by 2021. A year and three mnths later and I'm still not seeing these fueling stations they are hyping. That’s likely because the subsidy money ran out 😁. I suspect this is another case of where CEO’s, politicians and the like run around tooting their own horns about some new green technology that they are backing/or leading yet they have no real plans to see it to fruition. “Nikola’s business model has been vetted, and the investment world is taking notice. So far this year we have kicked-off plans to build the largest hydrogen network in the world with [Norway's) NEL, secured a massive 800-truck order commitment from [Belgium's] Anheuser-Busch, developed the most energy dense battery system on the market with almost 400 watt hours per liter, engineered a 240 kW fuel cell, kicked-off electric vehicle stability controls and electric ABS with [Belgium's] Wabco, designed a thermo-management and HVAC system with [Germany's] Mahle, finalized the most advanced class-8 independent suspension on the market with Meritor, relocated our company to Arizona to build our new 150,000 sq. ft. headquarters and now closed on $100,000,000,” said CEO Trevor Milton. Yes but I also read this on one of the news stories you posted on this thread. There is some stubborn science about generating, storing and transporting liquid hydrogen.. Here is an article from 12 years ago that reveals some of the same hurdles that remain today. Perhaps the generating, transporting, and storage hurdles will be overcome. But for now, I remain skeptical. Air Liquide generates, stores and transports liquid hydrogen all the time.